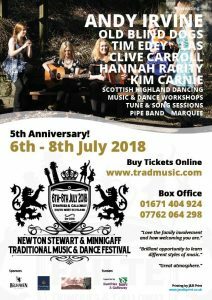 Tha sinn a’ dèanamh fiughair ri Newton Stewart Traditional & Acoustic Music Festival gu mòr – bidh cuirm-chiùil againn le Tim Edey & Hannah Rarity oidhche Haoine agus bidh Joy a’ cumail bhùthan-obrach dannsaidh agus seinn Disathairne. Brùthaibh air a’ cheangal gu h-ìseal son barrachd fiosrachaidh. An dòchas ur faicinn ann / Hope to see you there!